This site aims to explore the secrets of Furman's professional success, his roles in sports and regional histories, and the drama that swirled around him. This site also aims to display and sell some of the memorabilia Furman accumulated (see Furman's Memorabilia for Sale). Georgia Writer's Hall of Fame! Georgia Writers Hall of Fame induction. Midway Mirror newspaper & random documents from Furman's Pacific idyll. Furman's Golf Memorabilia @ thegolfauction.com! ...but, stay tuned, more items will be auctioned soon! 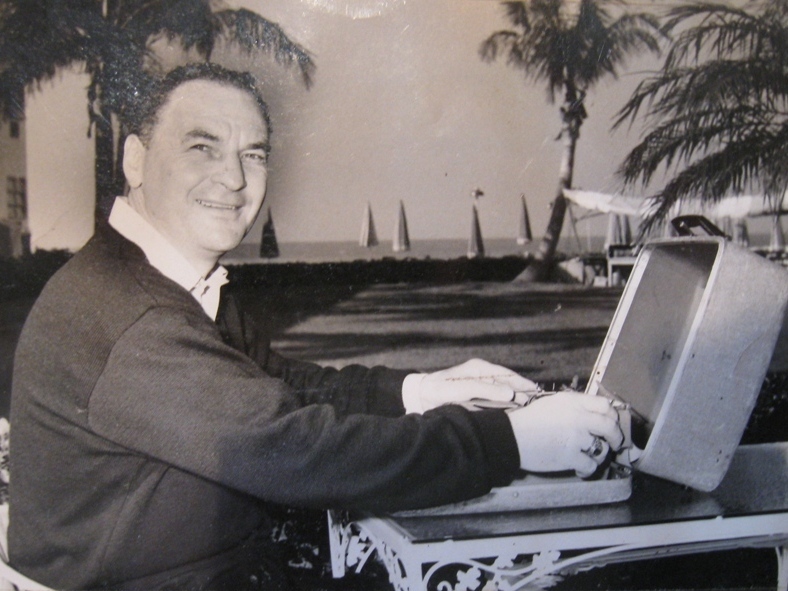 Furman Bisher tapping on his portable Royal typewriter at Sarasota, Florida in the during spring training in the late 1950s. Furman Bisher harped on today's issues in sports a generation ago! In the early 1960s... violence and serious injuries in football. In the early 1970s... skyrocketing sports salaries... and costs. "Without Bisher, Atlanta might have been Birmingham... He is, on the record, high among the most influential Georgians of the 20th century. 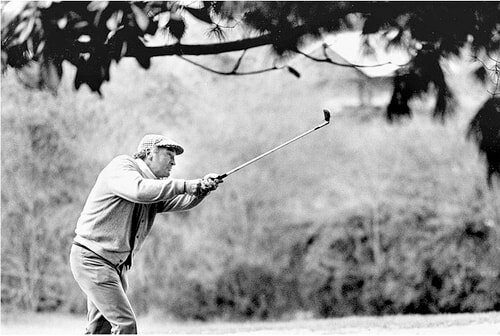 Over the past 50 years he has put more quality words on American newsprint than any journalist, sports or otherwise." "The good ones, the outstanding writers, are those who can see the color, the personalities and their relationships, the amusing and interesting sidelights and can tell about them in the good earthy prose the sports follower understands and appreciates. I mean fellows like [Grantland] Rice, [Ring] Lardner, [Damon] Runyon, [John] Kieran, to name a few. Furman Bisher certainly qualifies. He has the touch." more often than not, the words jumped off the page. It was as if he was sitting next to you, talking into your ear." "There have been certain staples and traditions that have always reminded me that I am at the Masters. One of those has been Furman Bisher." "There never will be another Furman Bisher." "Swimming was invented when Furman came to his first toll bridge." "Furman was a notorious penny-pincher, a miser, really... Shortly after we'd been Furman's house guests [in the days before cell phones], he sent us a $19 invoice for my wife's long distance phone call to her elderly mom on Christmas. But we loved him anyway."